In Petroliana > Gas Pump Globes > Show & Tell. This gas globe is not mine, but it is up for bid at Morphy's Auction estimated to sell between $10,000 to $15,000. The high bid is at $8,000 right now. 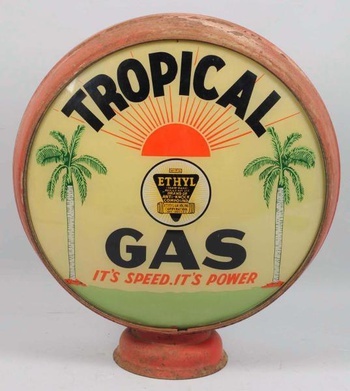 This globe was used in Florida during the 1920's and 1930's and is considered to be very rare. What a beautiful globe Tom! Never seen that brand before. Rare. Premium on top of that.